Filled with 16 oz. of American Soybean WaxTM. Measures 3"h x 5.75"w with a 50+ hour burn time. Refilling information: One container of Candle Refill Wax will refill this container one and a half times. 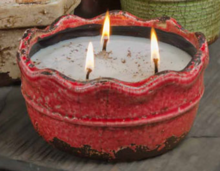 You will want to use three of the #60 wicks, and, to create the same look as the original candle, use our White Candle Refill Wax when refilling. If you have any questions, on wick sizes, refilling or how to refill, please call us before ordering! Occasionally we are out of a certain color/shape in the pottery, and we reserve the right to substitute color/shape of the same size and fragrance. If you are set on a specific color/shape, please give us a call toll free at 888-272-2773 M-F from 8:30 am to 3:30 pm EST. We can let you know exactly what we have available!